On my way home from Nozawa, I stopped at Torioi Kannon which is located on a hill of Nozawa district, 2.6km from JR Nozawa Station. 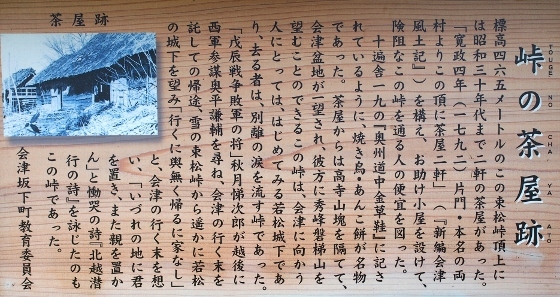 Torioi Kannon is one of three extra members of Aizu 33-Kannon pilgrimage tour, which is designated as Japan Heritage. 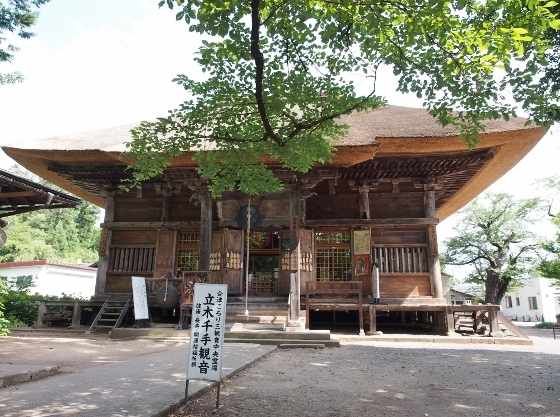 It is also one of three Aizu Korori-Kannon series together with Tachiki Kannon and Nakata Kannon, where if one visits all three Kannon Temples then he or she can live in good health until sudden death comes. Torioi Kannon belongs to Nyohoji Temple. 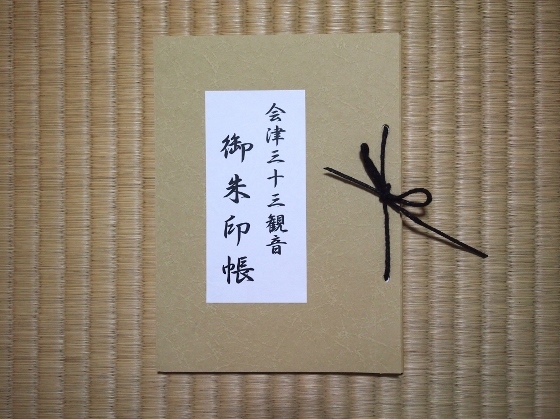 I also got Goshuin stamp on my Aizu 33-Kannon stamp book today. The real wooden Kannon statue is unveiled during special days and weeks in a year. 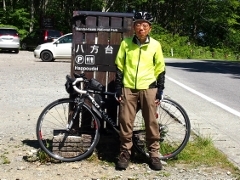 This is the final day, and I started from Aizubange and headed to Kuruma Pass of Nishiaizu Town, near the border to Niigata Pref. 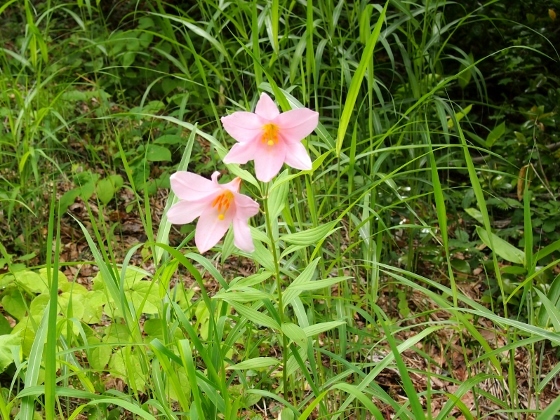 Kuruma Pass was Isabella's last stay in Fukushima, before leaving to Niigata. She wrote, 'this house (=yadoya) is magnificently situated, almost hanging over the edge of the knife-edge ridge of the pass of Kuruma, ---'. As I visited Kuruma Pass today, there was nothing but a description board that said Isabella stayed two nights here, as shown above. More details are shown in this article later. 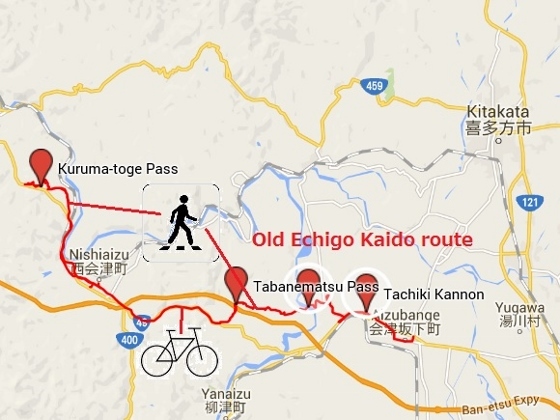 Leaving the center of Aizubange Town, I pedaled along the old Echigo Kaido (=Highway) all the way to Kuruma Pass. Soon I came to a bridge over the Tadami River at 'the hamlet of Katakado' as she referred to in her book. This is a bridge that Isabella praised such that '---so good a bridge as that by which we crossed the broad river Agano ----'. 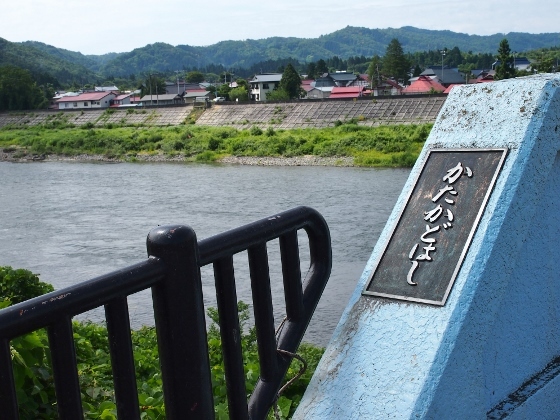 The name of the bridge is Katakado Bridge and the river was actually the Tadami River not Agano, as shown above. 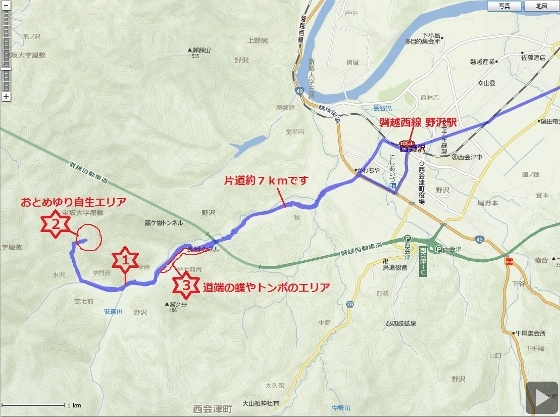 From Katakado of Aizubange Town to Nozawa, which is the center of Nishiaizu Town, Isabella took an old mountain route of Echigo Kaido passing over Tabanematsu Pass. The route barely remains today only for walk. 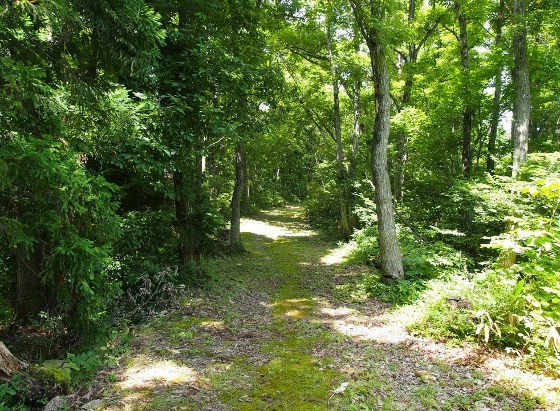 The entrance of this route was grass mowed road as shown above. 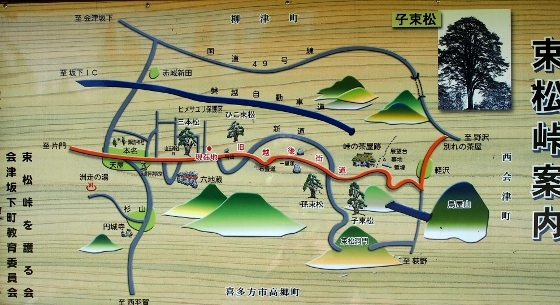 Going forward on this path, I found a map board of this old Echigo Kaido route to Tabanematsu Pass as shown above. This map board was created by a local preservation group. Photo above shows a view along the road. This reminds me how the actual path looked like in those days. But there were many other narrower and steep up and down mountain paths on the way, especially beyond the Tabanematsu Pass until getting to a regular road. I barely walked this path carrying by bike. 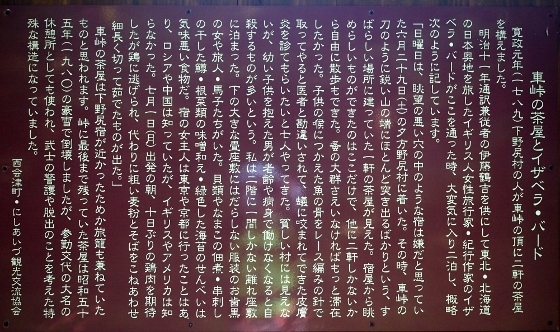 I finally reached Tabanematsu Pass and found a description board as shown above. It says that there were two tea-houses here and they served some specialty foods. 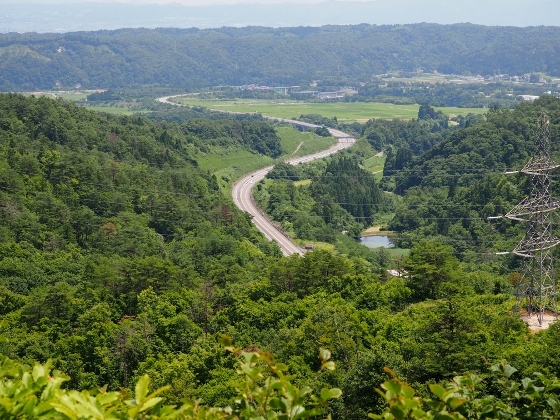 Along the path beyond the pass, I could overlook mountainsides and winding Ban-etsu Express way as shown above. 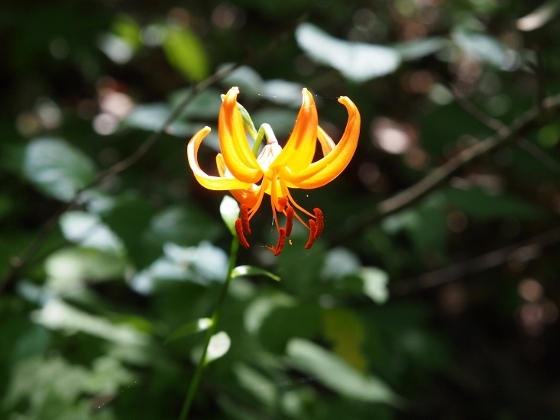 Also I found a small pretty orange flower of lily (Lilium medeoloide A. Gray) as shown above. 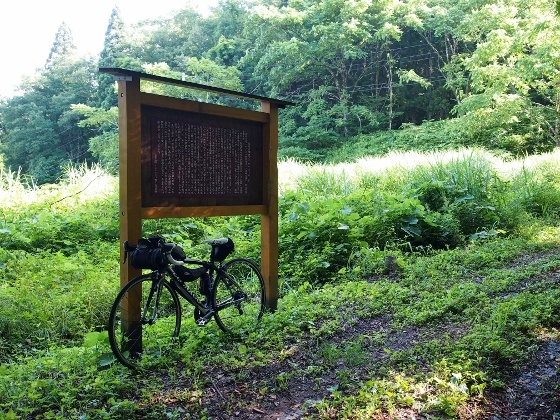 Then I pedaled along a paved Echigo Kaido, choosing old Echigo Kaido paths if there remained any, until I reached 'village of Nojiri', Nishiaizu Town. Photo above shows an entrance to the old pass of Kuruma. 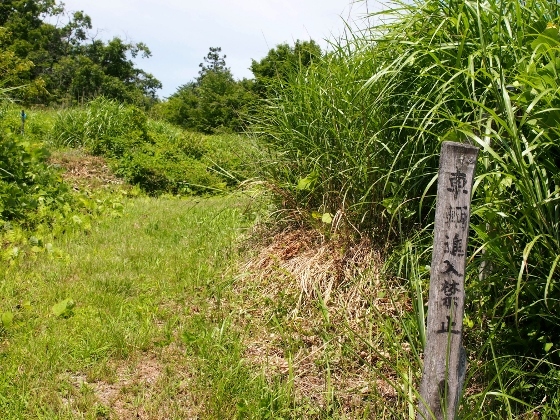 The old Echigo Kaido path remained unpaved and grassy. 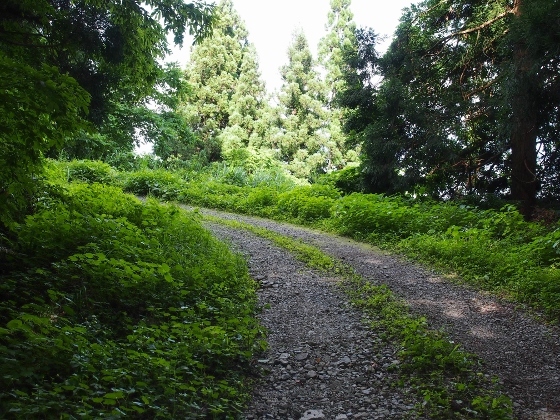 The current Echigo kaido is Kuruma Tunnel of National Route 49 running just beside this old path. Photo above shows a view at Kuruma Pass in wilderness today. There was nothing but a description board for Isabella Bird's track here. 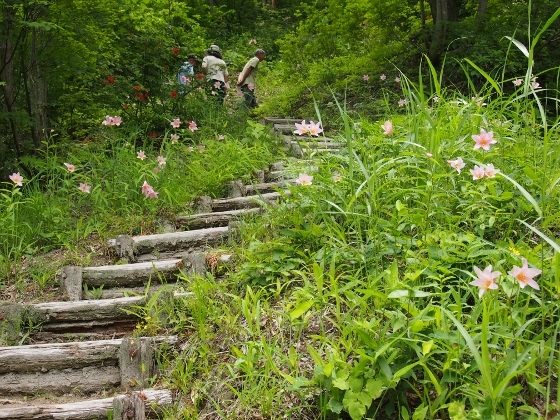 The old Echigo Kaido path beyond this pass continued for a while but finally it came to a dead end. Since there was no yadoya anymore at Kuruma Pass, I stayed tonight at yadoya in Nozawa. This was the last stay of my bike tour that traced Isabella Bird's tracks in 1878. I think I got some image of how she traveled and how she felt in those days. I am also grateful to local Aizu people for preservation work for history and reminder work for Isabella Bird's track. As additional information, I stopped at Tachiki Kannon Hall today, which was located along the old Echigo Kaido. 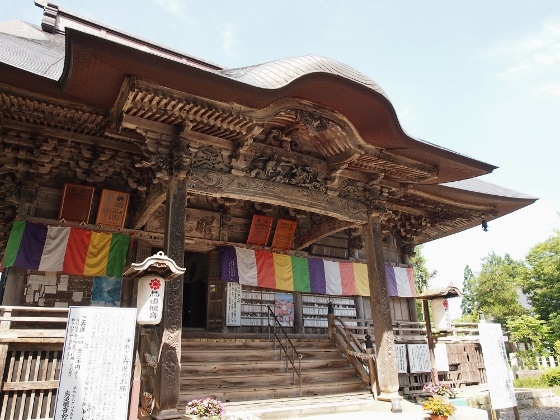 Tachiki Kannon is the 31st of Aizu 33 Kannons for Fudasho tour, which was recently designated as Japan Heritage. The hall building is shown above. 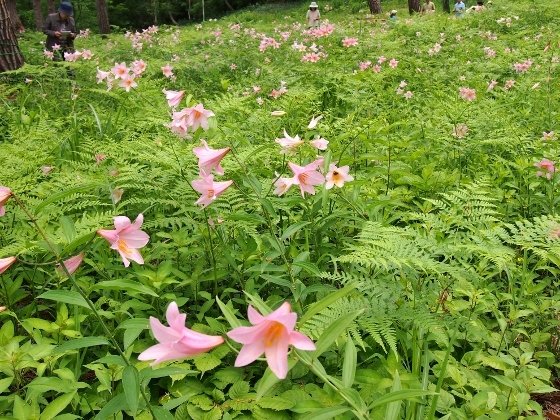 Today I visited natural habitat of Lilium rubellum (a kind of lily with pink flower) at Aza area of Nishiaizu Town. 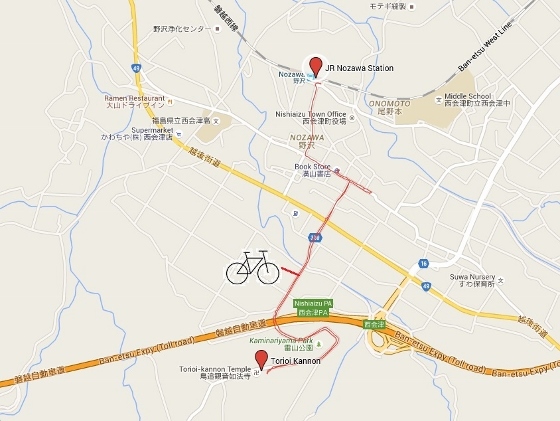 Since the weather was rainy I took Ban-etsu West Line train to Nozawa Station and then walked about 7km to the spot. 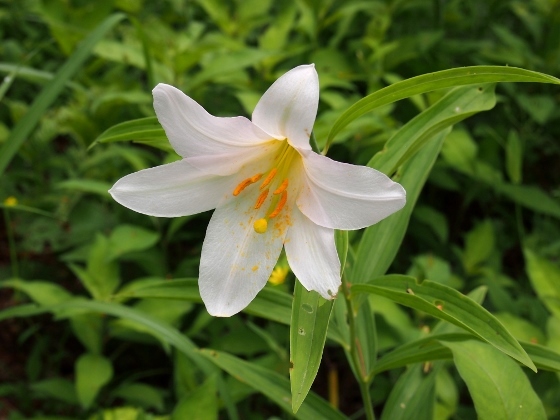 At Nishiaizu Town they call Lilium rubellum "Otomeyuri" which means a lily like a young girl and they have declared it the flower of the town. 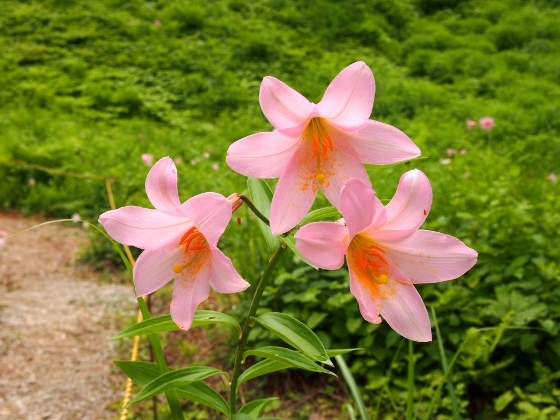 Lilium rubellum is a Japanese lily which only grows naturally within Aizu district and the surrounding area. 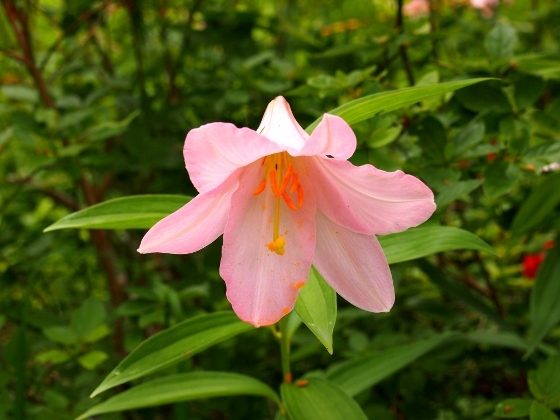 Color of the flower is pink. 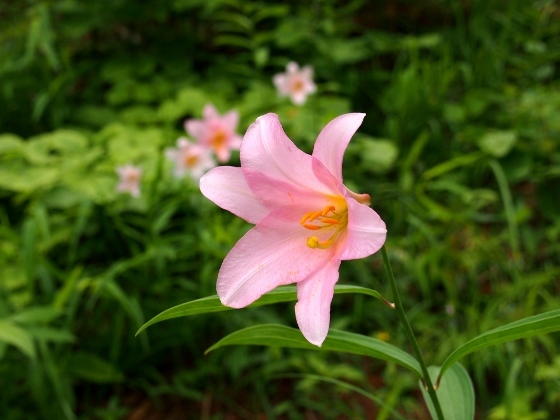 Lilium rubellum has been listed as Near Threatened (NT) in the Red List of Ministry of Environment. 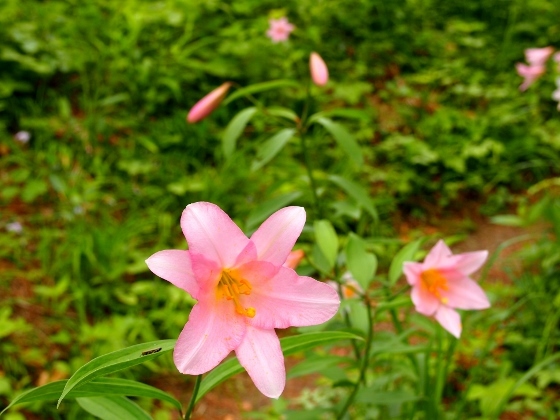 Aza area of Nishiaizu Town is one of the major natural habitats of Lilium rubellum. 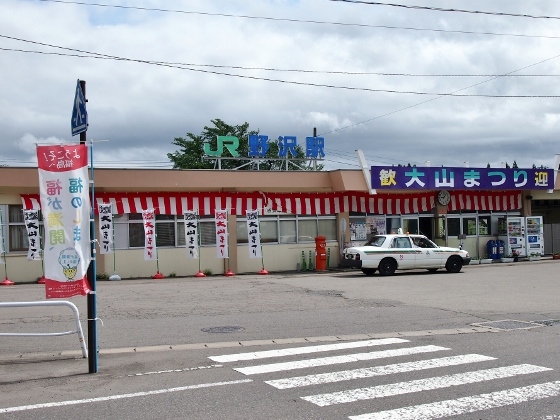 Above photo shows Nozawa Station of JR Ban-etsu East Line railroad. The station was located at the center of the town. I started to walk from here. 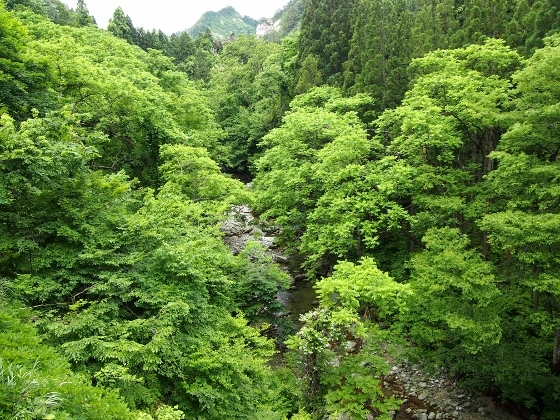 The road went along Aza River surrounded by full of fresh green leaves as shown above. 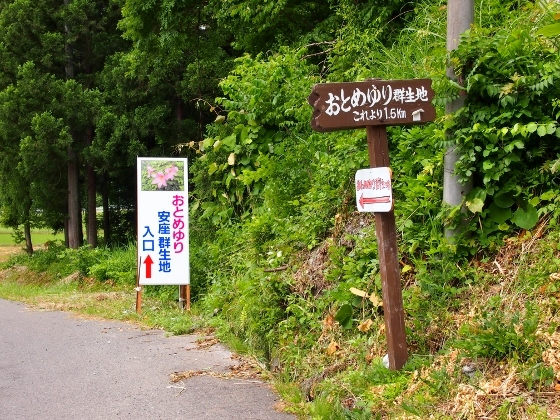 On the way I found a guide sign to the natural habitat of Otomeyuri. The location was red asterisk 1 in the map. Entering the natural habitat visitors had to climb up 150 steps as shown in the first photo, and then open field appeared as shown in the 2nd photo. The location was red asterisk 2 in the map. 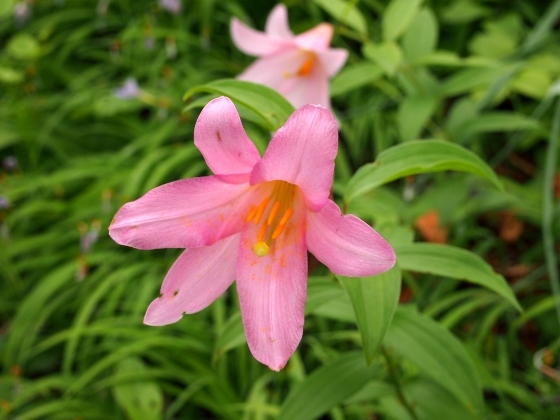 More pictures of today's Lilium rubellums are shown above. The best time will last five more days. Rarely could I find white flower as shown above. 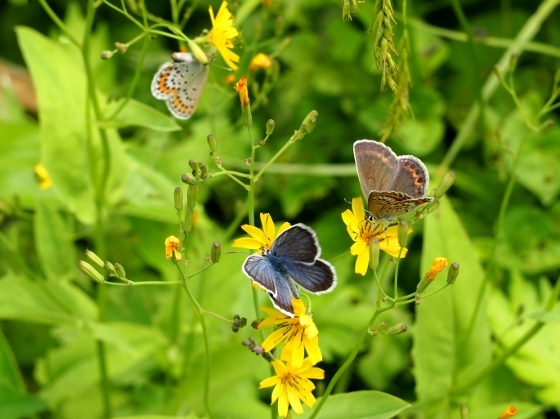 On return route I found butterflies and a dragonfly. Many tiny butterflies were on flowers. 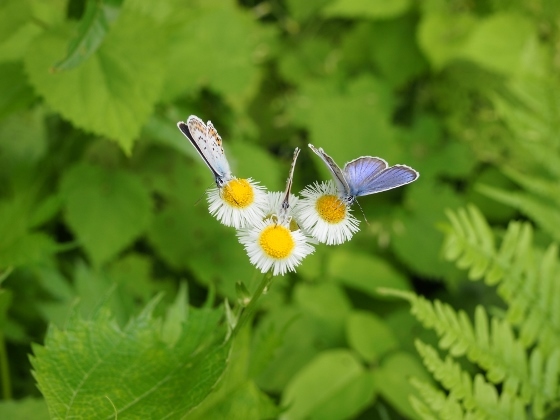 The kind was Plebejus argus. 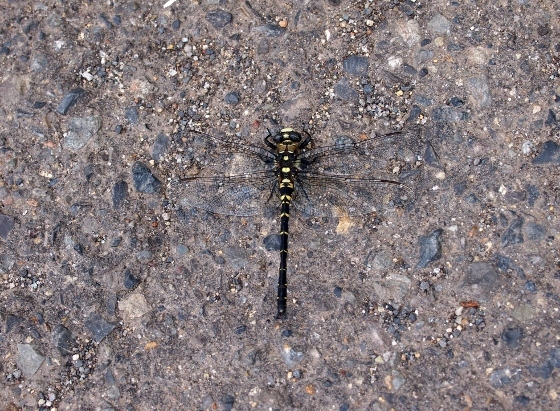 A dragonfly stopped on the road in front of me. The kind was Tanypteryx pryeri.